So, when Dear Daughter #3 saw the pillows I made for Dear Daughter #2 [which I haven't made a web page for as yet ... and I *know* I'm going to hear complaints on that score when this page goes live before the other one does. tell me again why I had kids? :-)] so anyway, Dear Daughter #3 opined that I DIDN'T LOVE HER ANYMORE .. eventhough she didn't WANT any of the throw pillows I made for her sister (oy vey .. why do kids do that???) ... I thought, just maybe she'd like some pillowcases. 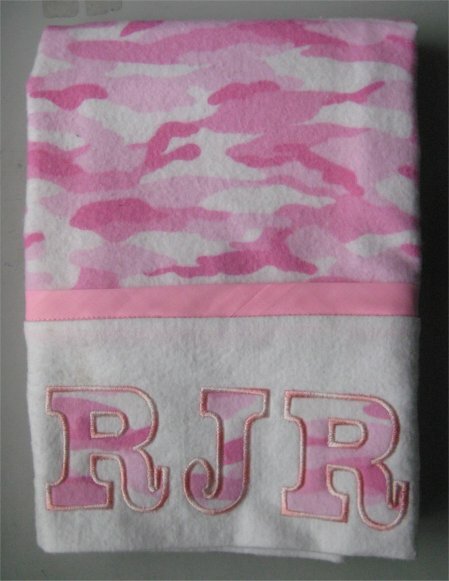 So when I found some incredible pink piratey fabric AND some pink flannel camoflauge fabric, it was a foregone conclusion that Rene would get something made from them. They became the pillowcases shown above. Here's a breakdown of each embroidered pillowcase and the designs I used on them. 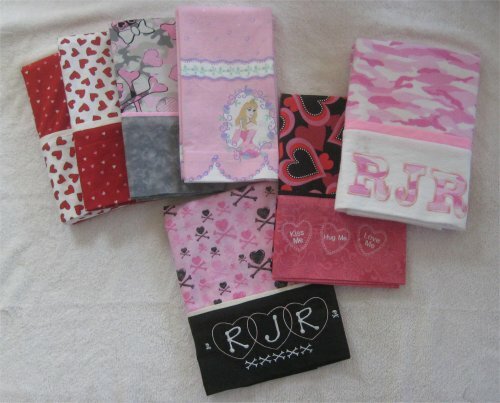 I chose the alphabets I did based on whether or not they would fit in the pillowcase band. I had some really lovely ones I had initially thought to use, but they turned out to be too tall. The heart intials are from Embroidery RN. Personally, I would have liked the satin stitching to be a just a little wider, in order to hide the foundation stitching. But, I just love the effect when you overlap the hearts! Check out the rest of her free alphabets ... there are a LOT of simply adorable ones! 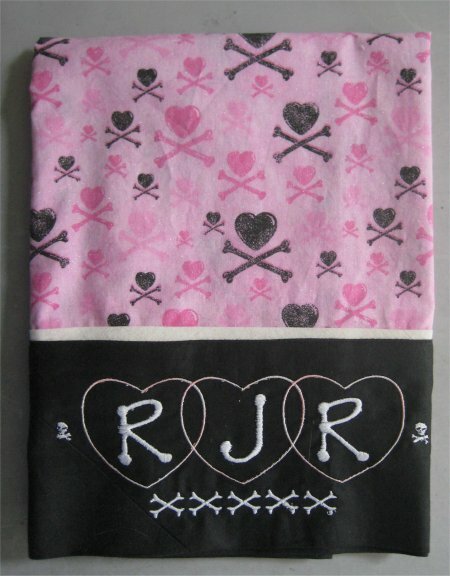 The crossbones also came from Embroidery RN. The delightful little candy hearts came from Artistic Thread Works. That link will take you to their Search page and the set with the candy hearts is "Valentine Hearts Set of 5". The specific design is ATG5334. Since I'm not a member of Artistic ThreadWorks, I rather suspect that it was a February freebie design and I picked it up that way. It's not a freebie any longer; you'll need to buy the entire design set. Thanks to Shebru of Martha Pullen's Embroidery Phorum for finding that design! Excellent sleuthing! This is an outstanding applique. Not only did the digitizer give us a placement outline but the foundation tack-down stitch is a substantial zig-zag. The applique fabric isn't going anywhere! The final satin stitches are absolutely beautiful. This is a case where I obtained the design file before I started keeping track of where I got it. The zip file contains ONLY the alphabet ... no identification information. I would love to be able to refer you to it .. it is a beautiful set of letters .. but I can't because the digitizer didn't put an info file in the zip! aarrgghh! 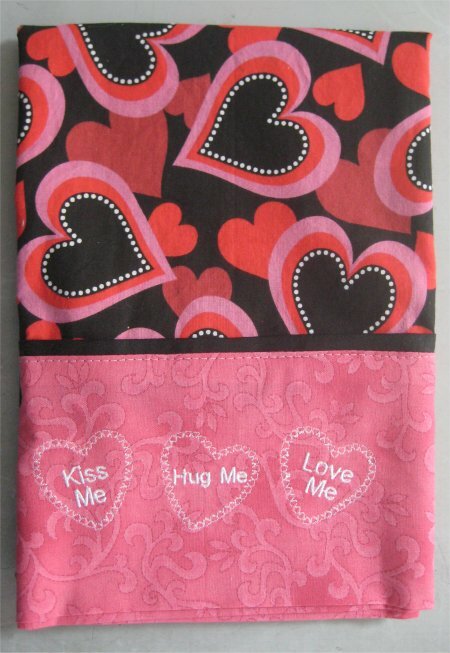 The pink pillowcase was a double border print with Disney classic princesses on one end.